You’re welcome, and thanks for the nice words! A young woman in kimono and traditional Japanese hairstyle looks at a white rose she holds. This postcard was published sometime between 1907 and 1918. 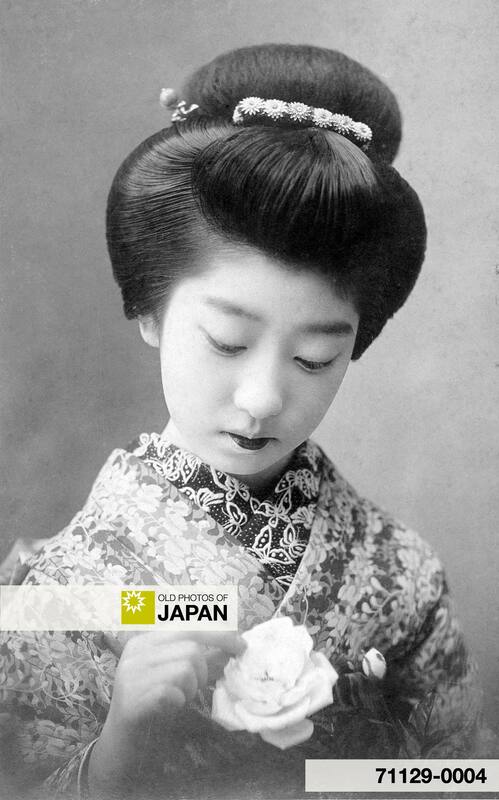 During the early 20th century, picture postcards of bijin (beautiful women) were extremely popular in Japan. The term bijin has a long history in Japan and is notoriously ambiguous. In a Nov. 6, 2006 UCLA lecture titled “Imperial Beauty: Photographic Truth and the New Spirit of Modern Japanese Aesthetics,” Lippit, a lecturer at the University of Southern California who earned her PhD from Yale, argued that discussions among Japanese artists created an evolution of the word bijin. Whereas bijin was used to describe either a man or woman during the Edo Period (1603–1867), by the Meiji Period it referred exclusively to beautiful women. A change that paralleled the development of modern Japanese aesthetics. The word was deeply ambiguous, Lippit argues. “Bijin [exist] in language, but [are] at the same time inaccessible through language,” Lippit said. “The term bijin underscores a crisis between language and visuality in addition to the issue of the fundamental ambiguity the term manifests—as a term that in the end cannot be defined,” Lippit said. In her talk, Lippit also described the reaction of Western critics during the Meiji period to Japanese aesthetics. The fact that beauty is notoriously subjective only increases the ambiguity of the word bijin. When Riyo Mori was crowned Miss Universe Japan on 15 March 2007, many Japanese complained that she did not represent true Japanese beauty. At the same time, current bijin displayed in Japan’s myriad weekly magazines certainly do not remind an observer of the bijin of the Meiji and Taisho periods. 1 Lim, Vincent, The Aesthetics of ‘Bijin’. Retrieved on 2008-02-16. 3 Chalfen, Richard, Beauty Up. Retrieved on 2008-02-16. 4 International Herald Tribune, Shampoo ads highlight changing image of women in Japan. Retrieved on 2008-02-16. 5 JAPANESE STREETS, JAPANESE STREETS. Over 10,000 photos of young Japanese people and models wearing contemporary fashion and make-up. You can also licence this image online: 71129-0004 @ MeijiShowa.com. This website has been incredibly helpful and informative for a basic investigation :) I’ve learned a lot especially with the added comments on the background information of each photograph. Thank you so much!